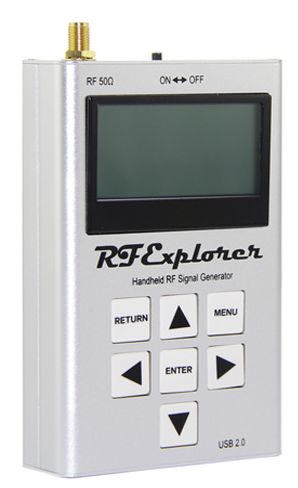 The RF Explorer Signal Generator (RFE6Gen) is a powerful, wideband, fully programmable RF signal generator. It is the perfect companion for the RF Explorer Spectrum Analyzer product line. As a standalone unit, the RFE6Gen can generate CW (continuous wave) and sweep signals by selecting the desired menu options. When connected to a PC, it can be fully programmed with the RF Explorer for Windows software tool. Furthermore, the unit can work as a powerful tracking generator when used with an RF Explorer spectrum analyzer connected to the same PC. This combination offers full SNA (scalar network analyzer) capabilities -- which allows characterization of filters, amplifiers and any 2-port RF device. At a cost of only $189 USD the RFE6Gen easily becomes one of the more valuable instruments in your tool box. Pocket size and light weight. Lifetime free firmware upgrades available, open to community requested features. High capacity Lithium-ion polymer internal battery for 16hs+ of continuous run, rechargeable by USB. Can interface to Windows PC running the RF Explorer for Windows software tool. Can be extended with internal expansion modules -- which allows for future band support and functionality.